Are you looking to upgrade your Taig mill or lathe? 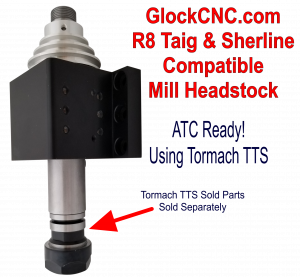 GlockCNC.com now offers upgraded headstocks to modify you Taig. They work on the micro mill, micro lathe and Taig-turn gang lathe. They will also be introducing their own 5C which will be more robust than OEM 5C from Taig Tools. Mainly because GlockCNC will over much higher grade bearing options, such as ABEC7 and ABEC9. They will also offer larger bearings to avoid the “squish” that can happen with the OEM bearings. 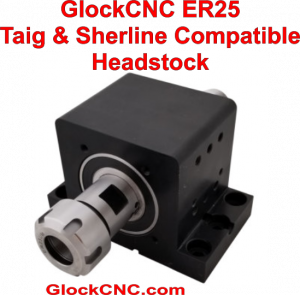 GlockCNC is a full dealer for both Taig and Sherline, so you can get everything you need from them. They are also a dealer for Tormach TTS (although they aren’t a dealer for the mills or lathes from Tormach). Their primary products are upgraded spindle arbors mounted in their own heavy duty headstock and motor upgrades. The motor upgrades offered for both Taig and Sherline are 750 watt and 1200 watt brushless industrial duty motors/drivers. Their mounting system looks pretty solid. It’s my understanding that they will also be offering a wider variety of belt options. Currently, the only belt option is what fits the Sherline directly. They offer pulleys with that groove size to fit the OEM Taig spindles. It sounds like they will offer an option to fit 5/16″ linked-belts and a timing belt option. Spindle are sizes range from ER25, ER32, ER40 to ER50 for the ER collet type. They also offer R8 spindles. Those are great for use with the Tormach TTS system. Take a minute and check them out.